Want a Great HandCrafted Cup of Coffee? Welcome to the Coffee Studio! One of the Treasure Valley’s independent coffee shops that opened in August 2012. It is located at 6360 N. Saguaro Hills, Meridian, ID 83646. A teacher and coach with a passion for connecting with people, Lyndsey says about her ‘best staff you could ask for,’ “A team that develops together well, works (and plays) well together.” One of the bold colors of this studio is the enjoyment of hiring employees without any experience, who are passionate about life and show dedication (to almost anything). Lyndsey spends two weeks training them on how to be a barista and three months on the language and passion of excellent customer service. “Teaching them how to talk to people, using positive engaging words, and inspiring employees to just love people,” is a hallmark of this coffee house. Lyndsey says, “To sell something you have to like it,” and to that end she is committed to sharing her knowledge and wonder of coffee to her employees, vendors, customers, and interviewers. 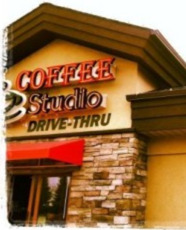 Coffee Studio, like many independent coffee shops in the Treasure Valley, create their own amazing blends based on customer input and satisfaction and a refined imagination. Welcome to the Coffee Studio where you are sure to be given a little peace and enjoy a handcrafted cup of joe.